Restless Leg Syndrome: Is Your Diet Related? As an everyday part of my sleep practice, I often see patients who complain of problems falling asleep due to symptoms in their legs when they get in bed. It can be anything from “restlessness” to “deep pain” in the legs, but almost always follows a typical pattern. What these patients suffer from is called Restless Leg Syndrome (RLS), and it is more common than you may think. Lets learn a little about it, and investigate whether or not diet can either lead to, or relieve the symptoms of this often misunderstood condition. Epidemiology: The numbers vary widely in the literature as far as the overall prevalence of RLS across the population, but it’s safe to say 5-10% of Americans suffer from some form of RLS throughout their lives. Importantly, this is not just a disease of adults, as it is felt that the overall prevalence is similar in children as well. In these children, RLS symptoms are often misdiagnosed as “growing pains” and the sleep disruption it causes often leads to night after night of unrestful and disjointed sleep. When adults get tired we get sleepy, when kids get tired they get cranky, agitated, disruptive, and even hyper. Needless to say, many experts believe unrecognized RLS in kids could account for a good number of cases labeled as ADHD. As in many things in sleep medicine, this remains controversial. Pathogenesis: RLS can be grouped into two main categories, as can many disease states; it is either primary or secondary. –Primary RLS is idiopathic, meaning there is no real identifiable cause. Observational studies point to it being a genetic disease with autosomal dominant inheritance. The underlying genetic defect occurs somewhere in the metabolism of dopamine in the central nervous system, although imaging studies using SPECT and PET imaging of dopamine producing areas have produced often conflicting data. Given that Parkinson’s disease is clearly known to be related to dopamine defects in the CNS, and the fact that Parkinson’s medicines have been successfully used to treat RLS, this is an important area of current research in Neuroscience. –Secondary RLS is felt to be caused by a number of other conditions; in other words, RLS is a symptom of these problems. Here are a few of the most common (and the one we are most interested in). -Iron Deficiency – Since the original description of RLS, iron deficiency has been considered one of the most likely causes. Study after study have consistently showed decreased iron stores (ferritin) in RLS patients vs. controls. MRI estimates of brain iron concentration in the substantia nigra (the area that makes dopamine) have also been consistently lower in RLS patients. That said, these findings are FAR from universal, so it is only part of the story. –End-Stage Renal Disease – If you take care of hemodialysis patients for very long, you quickly hear the same complaints of RLS pop up time after time. The cause of RLS in these patients has many theories, from iron deficiency to low parathyroid hormone (PTH) levels. Research is ongoing. –Diabetes Mellitus – RLS often co-exists with peripheral neuropathy and can be quite debilitating. –Multiple Sclerosis – The data on RLS and MS is in its infancy, but I can tell you that over half of my MS patients have clear RLS. There is a connection. -There are many other disease states related to RLS, and often listed in the miscellaneous file are vitamin deficiencies and obesity. We’ll talk more about them later. Clinical Manifestations and Diagnosis: Here is how UpToDate.com describes RLS. Although the subjective symptoms of RLS are often difficult to describe, the clinical features are highly stereotyped. The hallmark of RLS is a marked discomfort in the legs that occurs only at rest and is immediately relieved by movement. The abnormal feelings are typically deep seated and localized below the knees. Distribution is usually bilateral, but some asymmetry may occur and the arms can be affected in more severe cases. Terms that patients use to describe the symptoms include crawling, creeping, pulling, itching, drawing, or stretching, all localized to deep structures rather than the skin. Pain and tingling paresthesia of the type that occurs in painful peripheral neuropathy are usually absent, and there is no sensitivity to touching of the skin. Symptoms typically worsen towards the end of the day and are maximal at night, when they appear within 15 to 30 minutes of reclining in bed. In severe cases symptoms may occur earlier in the day while the patient is seated, thereby interfering with attending meetings, sitting in a movie theater, and similar activities. In milder cases patients will fidget, move in bed, and kick or massage their legs for relief. Patients with more severe symptoms feel forced to get out of bed and pace the floor to relieve symptoms. 1) An urge to move the legs, usually accompanied or caused by uncomfortable and unpleasant sensations in the legs. Sometimes the urge to move is present without the uncomfortable sensations, and sometimes the arms or other body parts are involved in addition to the legs. 2) The urge to move or unpleasant sensations begin or worsen during periods of rest or inactivity such as lying or sitting. 3) The urge to move or unpleasant sensations are partially or totally relieved by movement, such as walking or stretching, at least as long as the activity continues. 4) The urge to move or unpleasant sensations are worse in the evening or night than during the day or only occur in the evening or night. When symptoms are severe, the worsening at night may not be noticeable but must have been previously present. Dietary Treatment: There are tons of resources on the internet about standard pharmacologic treatment of RLS, and that is not the main topic of this post. What we are going to look at now is common non-pharmacologic treatments for RLS, in particular diet related treatments. Let’s see where this takes us! According to the RLS Foundation there are multiple foods that should be avoided in order to minimize or eliminate RLS symptoms. These include caffeine, alcohol, ice cream, as well as pasta and bread. Now you all know this is a Paleo blog, and are you seeing what I just saw? Pasta and bread??? Why? We all know why…say it with me…GLUTEN! Both Celiac Disease(CD) and Gluten Sensitive Enteropathy (GSE) lead to abnormal small intestine mucosa due to inflammation. This inflammation leads to malabsorption, and this is the pathway which connects it with RLS. We saw above that a classic cause of secondary RLS is iron deficiency anemia. We all know gluten is indigestible by the human small intestine, and it causes some degree of inflammation for anyone who eats it. People with CD or GSE have pathologic inflammation in their gut, thus making it impossible for them to appropriately absorb dietary iron. Give these people long enough and their ferritin and iron levels get low enough to put them at risk for developing RLS symptoms. So how related are CD and RLS? Lets look at some clinical data for answers. One study showed the incidence of RLS in CD patients to be 35%, of these, 40% also had iron deficiency. In another study, 31% of CD patients had RLS vs only 4% of the control group. Also, iron levels in this study were statistically significantly lower in the CD patients with RLS than in those without the disease. BUT, after all was said and done, no clear correlation was found in this study between RLS and either a gluten free diet or iron metabolism. Yet another study showed that GSE antibodies were NOT associated with RLS unless there was an associated underlying anemia. Everyone confused yet?! Let’s look at one more thing before we try to figure all this out. Interestingly enough, another commonly recognized cause of secondary RLS is magnesium deficiency. Many people with RLS are amazed to see a rapid resolution of symptoms simply by taking OTC magnesium supplements…but not all get relief. Why do some get relief, and some not? Why do very controlled studies show some people get complete resolution of RLS symptoms when adapting a gluten free diet, and other get no relief at all? Conclusion: Lets say your mom has RLS, and her mom had RLS, and her dad had RLS…what are your chances? I would say pretty good. In this case, there is clearly a autosomal dominant gene being passed down through the generations causing RLS. That gene leads to a yet unknown defect in dopamine metabolism in the substantia nigra of your CNS, and thus to your RLS. Gluten is no where in this picture! Although many want to believe that Paleo can fix everything, it simply can’t. Lets say one day your car stops running, and after checking it over you realize it’s just out of gas! You fill her up and she fires right up. I think we would all agree that your view is skewed if you believe that no matter what happens to your car, if it stops running, all you need to do is put gas in and it will work. Gas is not the only necessary part of your car to make it run! Likewise, gluten is just a piece of the puzzle. That said, gluten can be and often is an important issue to address in RLS. What is the pathway to a gluten free diet improving RLS symptoms? First of all, you have to have RLS that is secondary in nature, not primary. Next, the cause of your RLS needs to be either iron deficiency anemia or magnesium deficiency. (I by no means believe these are the only two nutritional causes of RLS, but they are the most common and most studied) Now, if your iron or magnesium deficiency is caused by malabsorption from CD or GSE, you may be in luck! This pathway explains why we have such variable results in studies concerning gluten, iron metabolism, and RLS. For someone’s RLS to respond positively to a gluten free diet they not only need to have an underlying gluten problem, but that problem must also be leading to clinical iron or magnesium deficiency. If we look at one of the studies above where the incidence of RLS in CD patients was 35%, and only 40% of those had iron deficiency; that means a gluten free diet will likely only help 40% of 35% of the original study population! Even that is if you get 100% response to the diet in those who are “primed” to respond. One of my biggest messages I try to get out through my blog is that although adapting a Paleo diet can do amazing things for your life and for your health, it can not substitute for traditional Western medicine in every instance. If your RLS is related to dopamine (in other words, genetically handed down), and you want relief of your symptoms, it’s best if you see your doctor and get a prescription for medicines that will increase dopamine in your CNS. You can go gluten free forever and never get the results that you need. Do not become single minded, it won’t get you anywhere but walking around at midnight again frustrated and tired. In the end RLS is a very important cause of morbidity in America, and around the world. How do I use this information in my practice? -In RLS patients I often recommend a trial of gluten free diet to see how symptoms respond, particularly in patients with no family history of RLS, or a positive family history of CD. -In iron deficiency anemia patients who fail to respond to iron replacement, I often test them for CD as an underlying cause of malabsorption. Think you may have RLS? Talk to your doctor or contact a local board certified sleep physician to get evaluated. I often used to tell patients that RLS would not kill them, it would just make them want to kill themselves. Recent data showing how short sleep times, in and of themselves, can increase overall mortality has me changing my tune. That topic though…is for another blog post in the future! I hope this post finds you all well, God Bless. PS – Because it’s fun to share, I thought I might give yall my two favorite “home remedies” that I’ve heard over the years for treating RLS. Now please, I DO NOT RECOMMEND THEM, just sharing. One gentleman told me his best method was putting homemade charcoal in a sock, smashing it up a bit, and rubbing the sock all over his legs before bed time. The blacker his legs got, the better he said he slept. This can only be outdone by the man who told me after years of experimenting, he found that rubbing paint thinner on his legs at bedtime led to a nice sound sleep…….. I quickly made sure neither he or his wife smoked! You just can’t make this stuff up…! Dig Dis Sci. 2010 Jun;55(6):1667-73. doi: 10.1007/s10620-009-0943-9. Celiac disease is associated with restless legs syndrome. Weinstock LB, Walters AS, Mullin GE, Duntley SP. Mov Disord. 2010 May 15;25(7):877-81. doi: 10.1002/mds.22903. Restless legs syndrome is a common feature of adult celiac disease. Moccia M, Pellecchia MT, Erro R, Zingone F, Marelli S, Barone DG, Ciacci C, Strambi LF, Barone P.
Source Department of Neurological Sciences, University Federico II and IDC Hermitage Capodimonte, Naples, Italy. Acta Neurol Belg. 2011 Dec;111(4):282-6. Prevalence of gluten sensitive enteropathy antibodies in restless legs syndrome. Cikrikcioglu MA, Halac G, Hursitoglu M, Erkal H, Cakirca M, Kinas BE, Erek A, Yetmis M, Gundogan E, Tukek T.
Sleep Med. 2009 Aug;10(7):763-5. doi: 10.1016/j.sleep.2008.07.014. Epub 2009 Jan 12. Celiac disease as a possible cause for low serum ferritin in patients with restless legs syndrome. Source University of Illinois at Urbana-Champaign, College of Medicine, 506 S. Mathews Avenue, Suite 190, Urbana, IL 61801, USA. The recurring series “Overcoming Medical Dogma” is a collaborative effort between The Paleo Mom Sarah Ballantyne, PhD, scientist turned stay-at-home-mom, and Paleolithic MD Dr. Ernie Garcia, MD, Internal Medicine and Sleep Medicine specialist. The goal of these co-written posts is to go beyond the typical physician-patient interaction where the patient describes symptoms, the physician diagnoses and prescribes medication and/or dispenses diet and lifestyle advice. In each post, we will discuss a common medical condition, the typical treatments that your doctor may recommend, and what you should know about these conditions that your doctor may not tell you. We will reference relevant research and present our recommendations for addressing this condition. Lastly, we will address the benefits of pharmaceuticals (prescription and OTC) as well as home/natural remedies which may help. What is Eczema? Eczema is a general term used to describe a collection of skin conditions (the most common being atopic dermatitis) in which the skin is inflamed and irritated. The inflammation in these skin conditions is in the epidermis, or outer layer of the skin, and this is the main distinction between eczema and other skin conditions. The presentation varies and can include any of the following symptoms: redness, skin edema (swelling), itching, dryness, crusting, flaking, blistering, cracking, oozing, or bleeding. It can affect any area of the body and areas can range in size from quite small to very large. Eczema affects about 10% to 20% of infants and about 3% of adults and children in the U.S. The most current research points to a different origin of eczema. It is now thought that eczema results from structural defects in the epidermis resulting in “impaired barrier function”. Essentially, abnormalities in the skin make it more permeable to toxins and antigens, which then causes an exaggerated immune response 1. You could think of this as “leaky skin”, where the skin no longer is able to fulfil its primary role as the first line of defence between the body and the outside world. 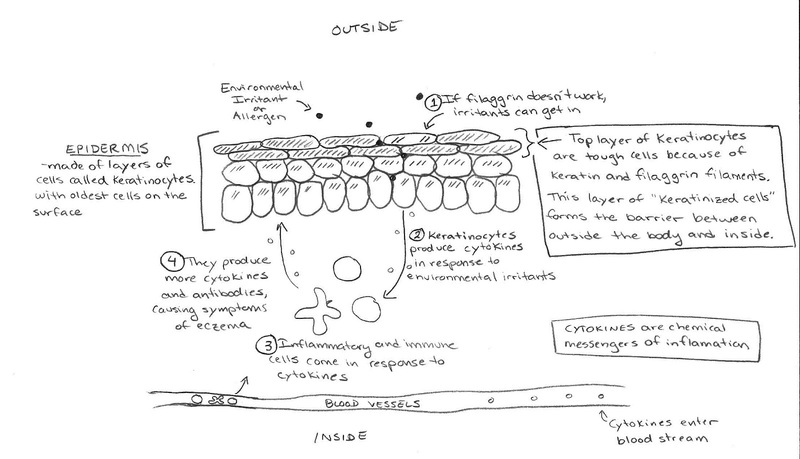 Once the barrier function of the skin is disrupted, various substances (like toxins, allergens, antigens; basically anything that the immune system views as a foreign invader) can “leak” in from the outside and this is what activates the immune response. This model is supported by recent isolation of specific mutations in the gene for filaggrin, a structural protein in the epithelial cells of the skin. This defective gene (and perhaps other similar gene mutations) may lead to a dysfunctional epidermal barrier and is likely the primary cause of eczema. What is your doctor likely to tell you about it? Your doctor will likely tell you that the exact cause of eczema is unknown, but it’s thought to be linked to an overactive response by the body’s immune system to an irritant. He or she may not be aware of the newest research on eczema, but that will not affect decisions on treatment. It’s fairly common and not life threatening. What is your doctor likely to prescribe? Treatment of any skin condition should always start with proper care of your skin. In the case of eczema, you should avoid triggers such as heat, perspiration, and low humidity, and keep the skin well hydrated at all times. The standard pharmaceutical treatment is the application of topical corticosteroid creams, which can be purchased in your local pharmacy or prescribed in stronger strengths by your doctor. If allergies are suspected, a daily antihistamine such as loratidine (Claritin) may be suggested. In severe cases, your doctor may prescribe an oral corticosteroid, such as prednisone. Now if you have your thinking hats on (and we’re sure you do), you are asking “If eczema is no longer considered a primary immune disorder, why is the standard of treatment aimed at stopping inflammation and controlling the immune response?” The answer is that the symptoms of eczema are indeed caused by an immune response, but it is a response from environmental triggers entering the body through “leaky” skin as opposed to an immune system run wild and attacking itself. What should you know that your doctor may not tell you? As discussed above, the most current belief is that those with eczema carry a genetic predisposition to “disrupted epidermal barrier function” 1. This could be thought of as “leaky skin” and is a very analogous to a “leaky gut”. In fact, because of the similar roles of the skin and the gut to act as a barrier, it is no surprise that eczema is also associated with increased intestinal permeability 2, i.e., a leaky gut. It is still unknown whether a leaky gut contributes to the development of eczema, however. A Comprehensive Approach to Treatment: We believe that a paleo diet is an excellent initial approach to dealing with eczema. This is because a paleo diet reduces inflammation and heals the gut. Including glycine-rich foods like homemade bone broth and organ meat can help speed the healing of both the gut and the skin (glycine is an essential component of connective tissue and the extracellular matrix that acts as a scaffold for cells). Sun exposure and eating vitamin D-rich foods such as fish and organ meat can be very helpful in speeding healing (you might also consider a Vitamin D3 supplement, but check with your doctor first). Consuming plenty of oily cold-water fish (at least three times per week) as well as eating grass-fed and pastured meat will also help because the high omega-3 content of these foods (and low omega-6 content) could help resolve inflammation. Anecdotally, most people report alleviation of their symptoms with adoption of a paleo diet. In extreme cases, or in individuals who do not see alleviation of their symptoms with out-of-the-box paleo, it may be worth trying a more restricted implementation of the paleo diet, such as the Autoimmune Protocol, a paleo version of the GAPS diet, or even something as simple as completing the Whole 30 Challenge from Whole 9 Life. Over the counter topical corticosteroid creams may still provide some alleviation of symptoms (most notably the itching) and might be required initially. Other moisturizers which may help heal the skin faster and relieve itching include extra virgin coconut oil and lotions containing calamine, aloe vera, arnica montana, Vitamin D and/or Vitamin E. Diane Sanfilippo provides herbal supplement recommendations in her new book Practical Paleo (herbal supplement recommendations are generally beyond both of our backgrounds and we recommend that you consult with someone with specific training in these supplements such as a Naturopathic Physician). If your attempts to control symptoms with diet and supplements alone do not produce adequate relief, we suggest visiting your doctor for advice on more specific pharmaceutical intervention in the form of stronger topical steroids or short courses of oral steroids in extreme cases. I have some awesome and very passionate followers who ask great questions. I’ve had exchanges with a few about my statin and inflammation post, and I wanted to share them with everyone in an easy to follow format. Here is my original post, and three comment exchanges that I think are very educational. Each commenter made great points and I tried to explain my side the best I can. I hope everyone finds them interesting. If you have not read the original post, I hope you will now! Question or comment? Send it to me! I tweeted a link to a study today about the use of Statin cholesterol drugs in essentially any patient over the age of 50, and how routine use in these patients significantly lowered their risk for a significant cardiovascular event (heart attack or stroke). Now before you just dismiss this as another example of how big pharma is trying to take over the world, let me tell you why you need to pay attention to this study. First of all it’s big…like 175,000 people big. In the world of clinical studies, that’s a very impressive number. The more patients take part in a clinical trial the more powerful it is in general. This study took 175K people and showed that even in patients with a very LOW risk for heart disease, statin drugs improved their risk of events significantly. Is this surprising? Not at all! Several years ago the so called JUPITER trial looked at the ability of statin drugs to lower what is called highly sensitive CRP (hsCRP). Studies have shown a very nice correlation between hsCRP levels and short term risk of heart attack. Levels below 1 are good, between 2-3 are moderate risk, and between 4-10 are high risk for badness. This trial took 18,000 patients with low LDL (bad cholesterol) and no cardiac risk factors and put them on statins vs. placebo. The results were so beneficial for the statin group that the study was called off early to allow the placebo group the chance to take a statin. The marker used to track benefit was a consistent drop in hsCRP in the statin group. So what does that mean? CRP is what we call a marker of inflammation. A regular CRP measures levels of inflammation throughout the entire body, while hsCRP was developed specifically to look at inflammation in the cardiovascular system. So if we can lower the hsCRP it means that we are lowering the inflammation in the cardiovascular system (easiest way to look at it). In turn, if statins lower hsCRP, then they must have anti-inflammatory activity right? That is absolutely right. It has always been known that statin drugs have a kind of two tiered mechanism of action. The significant improvement we see in cardiovascular risk seen in patient’s taking statins is too great to be coming only from a simple drop in the patient’s cholesterol. Statins go into the inflamed walls of diseased arteries and block inflammation. They are what we call “Plaque Stabilizers.” Heart attacks and strokes occur when an artery wall is inflamed and swollen with inflammatory markers and cholesterol. A plaque can be “stable” when it is relatively dense, or “unstable” when it is fluffy and chock full of inflammation and fat. One little irritation in the cap of an unstable plaque leads to a lighting fast inflammatory response and acute blockage of the artery with a clot. Anything downstream does not get oxygen; if its heart tissue you get a heart attack, if it’s brain you get a stroke. So statins without doubt lower your risk of heart attack by lowering your cholesterol, as well as lowering the inflammation in your arterial walls. This is essentially fact. Another action statins have on the inflammatory cascade of heart disease is that they counteract the known inflammatory effects of Omega-6 fatty acids. In our world where the fat pendulum has swung almost completely to the Omega-6 (over Omega-3) side of the aisle, there is no surprise that statins help so much. Again, this is essentially fact. The mistake that was made many years ago was in believing that statins purely lowered heart disease risk by lowering blood cholesterol levels. Linear thinking led to the belief that lowering dietary cholesterol and fat MUST in turn lower heart disease risk as well. Good idea, just not the right idea! Statins REALLY work through their anti-inflammatory properties to lower cardiovascular risk, but we didn’t figure that out till later! Easy mistake to make, but now that we know the rest of the story, we need to go back and correct our thinking. Unfortunately that is proving more difficult than many of us would like. One other thing to discuss is side effects of these medicines. I am completely amazed at the generalized fear and misrepresentation of the side effects of statin drugs. They have clear and known potential risks, particularly concerning the liver and with generalized muscle weakness. That being said, I can say in my clinical experience these drugs are generally very well tolerated and safe. I have been prescribing statins for near 11 years in both training and private practice, and I know of one definitive case of rhabodomyolosis (life threatening muscle breakdown) and only a handful of cases involving significant (but fully reversible) liver inflammation from the drugs. Are statins for everyone? No. Are they the most dangerous drugs in the world that should be pulled off the market? Absolutely not. They are safe, and they work. So, what am I saying? Does everyone need to be on a statin? Well, if we don’t change our dietary ways as a society the answer may be yes! In my humble opinion there is a better way of course! Say for example we significantly curtail wheat in our diet, as well as any other similar proteins that can cause generalized inflammation in our bodies. This should in theory lower our overall CRP levels, and likely our hsCRP levels as well. In addition, what if we concentrated on changing the fatty acid profile of our foods to shift the Omega-3:Omega-6 ratio back to the side of Omega-3s. This would be like turning back the hands of time in our food supply to a time when corn, soy, and wheat did not dominate our agriculture. We know (fact) that Omega-3 fatty acids are not atherogenic so we would easily lower our cardiovascular risks as a whole. With these two actions as a society we would accomplish the same thing as giving everyone a statin. Amazing huh? The problem is that these changes would be very hard to bring around. It is easy for us to sit on our Paleo high-horses and state the obvious, but it will be a real battle. A fundamental change in the way we raise our protein in America and around the world will be a daunting task. Finding ways to affordably feed the world’s population without a dependence on extremely cheap wheat based products will take years of work. It is not easy, but I feel it must be done. I hope this helps you think twice next time you see a headline about the benefits of a drug. Before you spout off some diatribe about the evils of big pharma, look closely at what it’s all about. Are statins overused?…according to this study they should be used more! And, we likely WILL use them more. That being said Statins work, they are safe, and most interestingly they teach us a great deal about inflammation, heart disease, and why our beloved Paleo lifestyle works. I hope this all made sense to everyone. If you have any questions leave a comment or feel free to tweet me at @PaleolithicMD. In the end…it’s ALL about inflammation! Steve: Great article, wasn’t fully aware of the Omega 6 issues. I am just curious which satin your prescribe because the Jupiter trial only used Crestor and because of the great findings the study was ended TWO Years early. When the Jupiter trial was presented at the ACC meeting, Crestor received a standing ovation because of the findings. Me: In general I see a statin as a statin. But, some have better data in some areas than others. Ultimately it is almost completely about Insurance Coverage. Many insurance companies require what the call a “step-edit”, or failure of a generic statin before I could even consider Crestor. It is a good drug though, and is used often. I bet a similar study with another statin may yield similar results; probably a class effect to some extent. Tami: Interesting. I think you are the only paleo advocate I’ve ever read in favor of statins. My father, my uncle (on my dad’s side), another uncle on my mom’s side, a neighbor, and a friend were all on statins and all had the horrible side effects. Extreme muscle pain, loss of memory, fatigue. My dad was also on blood thinners for 15 years and never had trouble regulating them, until he was put on a statin. After that he was unable to keep his blood at the correct levels. Isn’t the listed percentage of people that have these side effects something like 5-10%? My question is, if statins’ side effects are so rare, why did ALL of these people in my small circle of family and friends have such severe reactions? Coincidence? Does that just mean that 90% of the other people I know that are on statins (unbeknownst to me) have no side effects but just never say anything? Also, the people I listed above are not the only people I know that have had these problems, the ones I listed are just the people I can name off right away. I’m not trying to be argumentative, I really do want to understand. Both of my grandfathers, my dad, all four of his siblings, and three aunts and uncles on my mothers side have had heart surgery and/or heart attacks, so that is a fate I very much want to avoid. Obviously, I believe eating paleo/Whole30 style is the best thing I can do for myself, or I wouldn’t be reading your blog. Sorry for the long comment, but what you said just raised some questions I’ve had in the back of my mind for a while. Me: No problem at all on the long comment, I really welcome the dialog here on the blog. Also, I’m sorry to hear that so many in your circle have suffered from the problems that they have. Let me explain where I am pro statin, and where I am not. I hope it can help you understand my point of view better. If you have a known history of coronary artery disease, diabetes, significantly elevated cholesterol, or a combination of other cardiac risk factors such as a strong family history, smoking, or obesity you need to consider a statin to control your cholesterol. Or at least put it this way; in my patient’s I will give them a choice. They can either follow a VERY strict Paleo diet and we closely monitor the cholesterol for improvement, or they continue with their eating lifestyle and take a statin. It is very common for people to refuse to change their diets to the extent they need to in order to avoid cholesterol medication. It is also medical malpractice in high risk patients not to recommend they go on a statin if they will not change their numbers with diet. Regardless of what many may want to believe, the science is fairly strong that statins save lives in these individuals. I would agree with your 5% stat on common side effects such as muscle aches, but I have honestly only had one patient that I felt may have been affected by statins when it came to their memory. I am not at all saying it is not possible, but my experience and the experience of my 8 partners do not see that as a common issue. Lets say you take a 65 year old male with well controlled but treated high blood pressure, a history of diabetes and obesity who has a total cholesterol of 250, HDL of 35, LDL of 140, and Triglycerides of 160. Using a well established heart disease risk calculator his 10 year risk of having a heart attack are >30% and their calculated “heart age is >80. Take that same gentleman and aggressively lower the total cholesterol to below 160, and raise their HDL to 50, and the 10 year risk of heart attack drops to 21.6%, and his heart age drops to 72. That means in 10 years you can save one life by changing their cholesterol profile. These are real numbers, so people have a choice. I do not care how they lower their cholesterol, but they need to. The reality most choose statins over dietary change, and therefore I use them accordingly. Many will say, wait!, you said lowering the cholesterol isn’t how statins really work! You are right, I think that the statins ability to lower risk in these patients, although certainly in part due to lowering cholesterol (particularly newer generation statins that appear to shift the overall LDL size from the more dangerous small size to the less worrisome large, fluffy size), is mainly from the anti-inflammatory action they have. I discussed in the post how the Paleo diet should lower inflammation, shift LDL particle size to larger particles, and thus lower cardiac risk as studies indicate. The side effects are real, but death from a heart attack or stroke are more real to most of these patients. They are not going to change their diet, so any suggestion that statins go away purely on “principle” is hard for me to accept. I cannot judge my patients if they choose not to make the dietary changes I have made in my life. It is essentially down to either face a very high risk of heart attack, change your diet, or have muscle aches with the statin. What we need is clear clinical data showing that Paleo works, and that it changes people’s cholesterol profiles in the ways we know will help reduce their cardiovascular disease. Hopefully as a community we can move those things forward in the years to come. Again, individual cases are very real to those who experience them, and all that I can speak to is MY experience with these drugs. Although I practice and preach Paleo as much as I can, I have patients to take care of. There are many who feel changing to a Paleo lifestyle is simply impossible. Although this is my optimum choice for them, there always has to be a plan B, and for cholesterol at this point it is statins. I believe it is imperative to seek change as a physician moving people towards a new vision of nutrition in America looking more realistically at the role of fat and carbohydrates in our diets. That said, I also believe in science, and the science sometimes calls for the use of drugs to prevent disease. It is science after all that we use to defend the Paleo beliefs that we hold so dearly. I really hope this helps even a little bit with your questions. I care deeply for my patients, and I really hate that you have had these experiences. Tami: Thank you very much for taking the time to answer my questions. That clarifies it quite well for me. I understand completely how hard it must be for you to talk people into changing their diets. I have tried talking to family members who have health problems into just changing what they eat a little bit and they don’t want to listen at all. I guess they have to want to help themselves before they will listen to anyone or anything, even a doctor. If you would rather take a pill than work to make your life better, then I guess you get what you get. The side effects my friends and family experienced with statins were much more severe than muscle aches. My dad had muscle pain so severe he couldn’t work (he was a cattle rancher), and started to get disoriented and confused (dementia type symptoms.) As soon as he quit statins the symptoms stopped. My neighbor also had dementia type symptoms so severe that his family thought he was getting Alzheimer’s. He stopped the statins and the symptoms went away. I guess I have a bit of a bias against statins because I saw firsthand how they suffered, and it made me a bit angry every time I would hear of another person I knew having problems with them. Thank you again for your time. I just found your site yesterday through Whole9, and I am enjoying it very much. Me: I really am glad you are enjoying the site, and I again am sorry you have experienced such terrible side effects through those that you know. One particular patient comes to mind that had some dementia issues and the family was concerned it could be the statin. Quite honestly at that time I had not heard of statins causing many memory problems, but after researching it for them I found there have been some cases reported. We stopped the stain and saw minimal improvement, but the patient’s dementia progressed quite rapidly. The family actually requested an autopsy as they were given the option to do so for a dementia study at our state university. His brain ended up showing typical findings of severe Alzheimer’s dementia. So, I don’t think it was the statin. My guess is that a statin could affect a patient’s liver, cause muscle breakdown, and through that affect cognitive function. All these changes should be completely reversible if the statin is removed in time…That’s just a theory of course. Clearly your story shows statins can cause real issues. Again, I’m thankful I have not seen side effects to this degree in my patients. The debate will go on! Tami: I re-checked on the symptoms my neighbor had and I was wrong, he didn’t have dementia symptoms, it was Parkinson’s-like symptoms. He had severe shaking and tremors, and they ceased after he stopped taking statins. For what it’s worth, I asked some family members today, and my dad and my uncle were on Lipitor. I think the aforementioned neighbor and my other uncle were also on Lipitor, but I’m not 100% sure about that. John: Your opinion of the usefulness of statins in patients with known histories of CV disease, family history, obesity, or highly elevated cholesterol makes sense. But what is your opinion of the common practice of GP’s prescribing statins to folks with only mildly elevated cholesterol that could be easily controlled with simple dietary/lifestyle changes but are never offered as an option? In my experience, that has become common practice. Many relatives and friends have been prescribed statins in a ‘knee-jerk’ fashion for only mildly elevated total cholesterol, with no distinction made between LDL/VLDL/HDL, etc. Furthermore, if it is mainly the anti-inflammatory properties of statins that deliver the benefits, why do the great majority of docs use ONLY cholesterol numbers as their marker in making a determination- without considering CRP and other inflammation markers? There are several quality cohort studies, as I’m sure you are aware, that call into question the entire cholesterol/heart disease hypothesis altogether. Would like your take on these issues, which cause me to believe that although statins can be beneficial in the cases you describe, it is being wildly overprescribed and for the wrong reasons to folks with no cardiac disease or family history. Thanks for your excellent site! I’m also not sure that physicians are necessarily having a “knee-jerk” reaction in prescribing statins…it’s a programmed reaction. The age at which we are seeing patients exhibit heart disease or strokes is going down steadily. It’s not uncommon at all to admit a 40 year old with a heart attack. In addition the American Heart Association and similar organizations continue to drop down the recommended treatment goals for cholesterol due to these changes in the epidemiology of heart disease. They are doing this due to the belief that lowering cholesterol will lower heart disease…which is of course only partly true (a small part at that). So, I do believe most doctors are prescribing statins more in a real effort to help. They are following the recommendations of the organizations that are supposed to know what they are doing. Many also likely fear potential malpractice claims if something happens to the wrong person and a lawyer wants to argue the physician wasn’t “aggressive” enough. Blame is the name of the game in America right now. I know of a physician who had a 43 year old “healthy” male (but a smoker) die of a heart attack and he was sued by the family for not more aggressively lowering his blood pressure and cholesterol. The man’s numbers were not terrible, but attempt was made to blame someone other than the smoking patient. People on the outside will never fully understand the pressure physicians feel to not get sued. This is a side of “over-prescribing” that is greatly under appreciated. Solving this will have to be led from a higher level than primary care doctors. The paradigm will have to shift higher up to allow more physicians to feel comfortable to prescribe against the current status quo. You also talk about “simple” diet and lifestyle changes. Don’t get me wrong, I COMPLETELY agree that these lifestyle changes are easily achievable, but most patients roll their eyes. Of patients I discuss a paleo lifestyle with, more than half essentially laugh me off and say its “impossible”. I’m sure many physicians who may want to approach things differently are just tired of getting laughed at, and just write the script. I’ll admit there are some patients even I won’t introduce Paleo to…I’d be wasting my time. I do all I can to get people to change, even follow Paleo myself, but it doesn’t always do much good. I don’t want to come across as just defending the status quo, but I want this site to be about melding together Paleo and modern day medicine. To that end, I want everyone to better understand why physicians do what they do. Most physicians want to help their patients at all cost. They believe, and are being TAUGHT at this time that frequent prescription of statins is a means to that end. Our goal as a Paleo community has to be to push forward real science to challenge the status quo, and bring down total philosophy change from the top. This will free many physicians to approach common chronic medical conditions differently. Statins are over prescribed, but the Paleo lifestyle is also underutilized…even by patients who know what it is and are given the chance to benefit from it. Is has to be a two way street. Doctors need to change, and patients have to be willing to listen! Hope this makes some sense. We are both on the same side, we just have to all figure out how to reach our common goals.